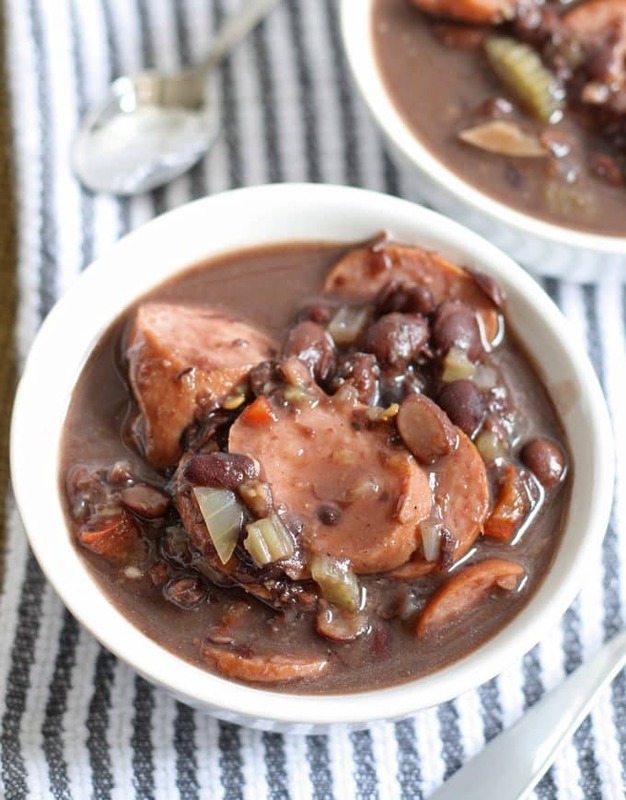 A delicious and easy recipe for slow cooker black bean turkey sausage stew. It requires very little prep but packs a lot of flavor into every bite! I’ve been working really hard to update my photos and recipes to make them easier to make, understand and look at. New pictures will do that to you – make you hungry and make you want to get cooking. My love of black beans strikes again. So far, we’ve made black bean burgers, black bean dip, and Cuban black bean soup. 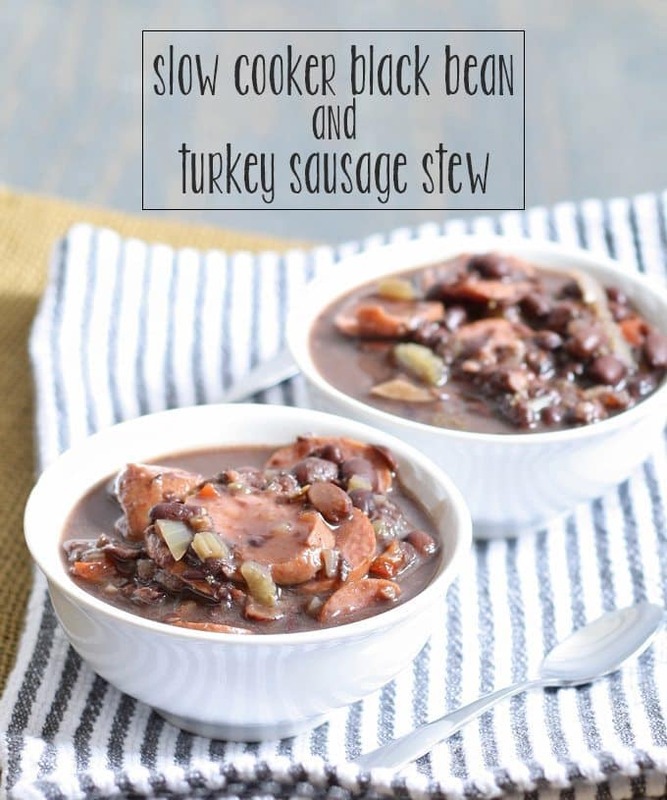 Today, I made slow cooker black bean turkey sausage stew. It is so delicious and so hearty. I can still smell the cumin in the kitchen – I love cumin almost as much as black beans. When you have cans and cans of black beans around, its hard not to use them when you’re throwing something together. 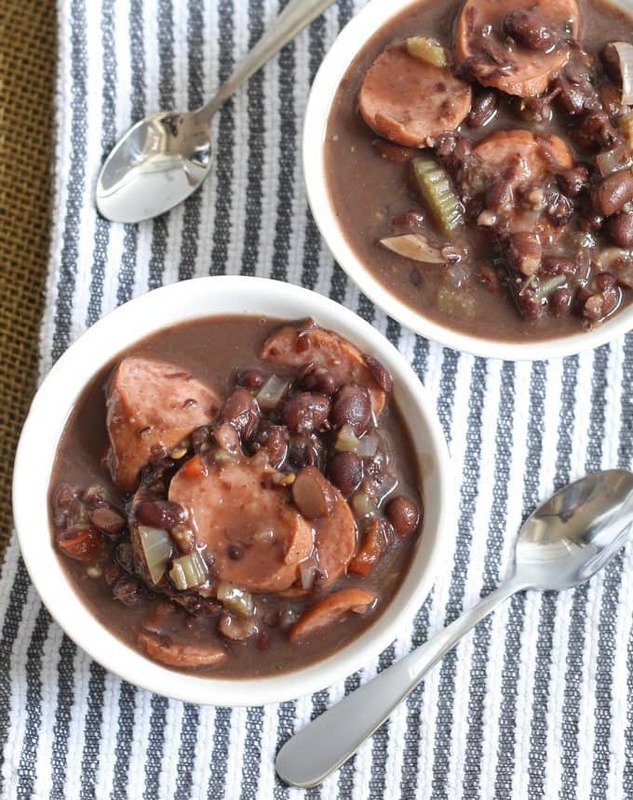 This black bean turkey sausage stew just kind of *happened* one day. My slow cooker was looking at me and I just couldn’t help myself. Mr. B and I were looking for something hearty to eat and I started concocting an idea and then this happened. If you want a thicker stew, take out 1/2 a cup of chicken broth or puree an additional 1/2 cup of soup before adding the turkey sausage. Don’t do both however … or your stew will be like paste. This makes a rather small portion, so when I make it again, I’m going to double the recipe. And I’m probably going to make it again soon. I had one helping, and then as soon as I finished I went back right away and had a second helping. I hope you enjoy it as much as I did. 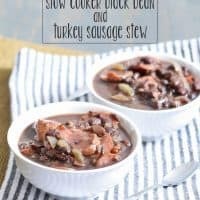 Combine all ingredients except for the turkey sausage in a slow cooker. Stir. Cover and cook on low for 6 hours. Remove 2 cups of mixture and put in a blender until smooth. Return to stew. Add sausage and stir. Cook for an additional 30 minutes on low. This looks really good, Thanks for linking up at Project Pin it! It’s been been to the Project Pin-it board on Pinterest. Thanks Denyse! Have a great day! Can’t remember the last time that I made a stew. After seeing this post, it is definitely something that I am inspired to make! The perfect hearty stew on a cold winter’s day like today! This looks fantastic! I would love if you would share this at The Soup-er Recipe Link Up! I added it – what day does your party go live, so I can add it to my link party list? You’re very welcome Alexis!! Thanks for the great party! This looks like a yummy and hearty stew! Thank you for sharing on Found & Foraged! Thanks for stopping by Kyla! 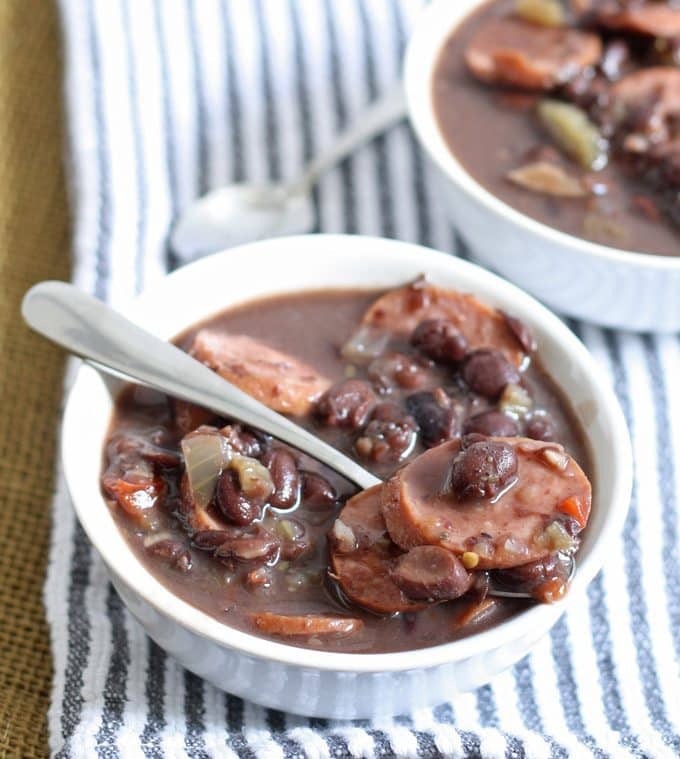 I have had several different varieites of black bean soup but I love the added protein of the turkey sausage in your recipe. I can’t wait to try this! Thank you for linking it up at the This Is How We Roll Thursday party. Black Bean soups are my absolute favorite 🙂 Thanks for stopping by!